I picked up this book mainly because of George R.R. Martin's comments about it - how it was one of the books that had inspired him to write A Song of Ice and Fire. The Iron King is not anywhere near as complex as A Game of Thrones, but it is clearly a set up for the rest of the series (which probably will get more complex). 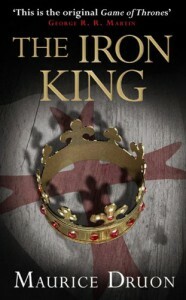 Comparisons to GRRM aside, the Iron King is still a brilliant piece of historical fiction. I especially appreciated the historical notes dispersed throughout the novel - the author really did his research, even some of the smaller historical details weren't left out (e.g. there's a nice little note on the production of paper). For fans of A Song of Ice and Fire, the Iron King is a great distraction whilst waiting for the next GRRM book!